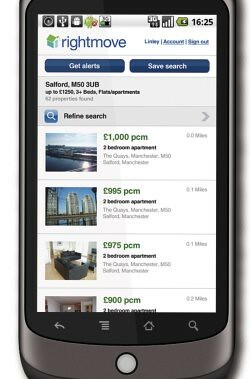 Having already launched apps for iPhone and iPad, property search website Rightmove has moved to cover other devices with a new mobile website. The new site is built in HTML5, and replicates the GPS and mapping features of the app, and extends Rightmove’s reach to the rest of the 13m smartphone users in the UK. Anecdotal evidence, as well as that from research firms, is that Android is gaining mobile market share rapidly, thanks to having multiple devices on the market at a range of prices that Apple cannot match. For brands, this means that launching a mobile presence through iPhone apps alone is no longer an option if they want to gain maximum exposure. With a number of app platforms to cater for, a mobile website is the easiest way to appeal to as many mobile users as possible. I reviewed the Rightmove iPhone app last year, and it is a very useful and feature rich app, and the mobile site is equally impressive. As Stephen Mellish says, it manages to recreate the feel of an app and, having tried both site and app, it’s hard to find any major differences. The mobile site has performed well so far too, with 100 leads per day delivered from the new site since its launch last week, while Sunday saw 100,000 visits to the site. This doesn’t mean that brands shouldn’t develop iPhone apps though. While Android is growing fast, the iPhone still accounts for the majority of mobile internet usage, and most firms will see the majority of their mobile traffic coming from Apple devices. This is certainly the case with Rightmove. While 12% of visits to Rightmove from mobile devices are from Android phones, and 8% from Blackberries, the iPhone still accounts for 52%, and the iPad 12%. Also, exposure for brands via the App Store can be valuable for building awareness of brands’ mobile presence. Rightmove’s iPhone app has been a success so far, having had 870,000 downloads over the past year, and it currently drives more than 1,000 leads per day to estate agents. When I looked at the pros and cons of mobile sites and apps earlier this year, one of the biggest arguments for the app was greater functionality for users offered by apps; features such as finding a user’s location via GPS, and barcode scanners. However, if these functions can be replicated on mobile websites, if the handset allows, then the argument for developing a mobile website rather than an app becomes even more convincing. What will Google announce today? Museum of Modern Art in San Francisco later today.